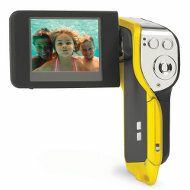 This Underwater camcorder can record video to a depth of 10 feet. Hammacher has an underwater camcorder which snorkelers can use to video to a depth of 10 feet without a case. Ironically named “The Shirtpocket Underwater Camcorder” (since diving isn’t really a shirt sleeve environment), it seems loosely based on the Samsung/Aptek style with 2 1/2″ LCD color screen and SD expansion slot. The 8MP camcorder chip can record up to 60 minutes of standard definition MPEG4 video or take up to 300 digital still photos with the included 2GB sd card. The expansion slot can support memory up to 8GB. Additionally, it carries a 4x digital zoom capability. One additional feature, the camera serves as a voice recorder and can double as an mp3 player. USB connections allow for direct upload to your PC and the rechargeable Li-Ion battery has a life of just shy of two hours with a real time recharge time.